Westemnet Master with the Cook Crafting Guild. 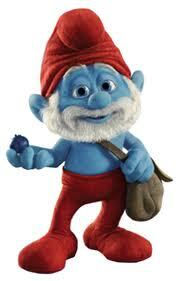 With his white beard, red hat and pants, Kipling is the leader of the "blue dwarves" and quite a wizard too. He was 542 years old last spring. He is a wise old "blue dwarf", who tries as much as he can to stop the "blue dwarves" acting like crude humans. Everyone in "blue dwarf" Village turns to Papa "blue dwarf" (kipling) when things go awry. Papa is always busy making magical spells and potions in his laboratory. His house is a huge laboratory with several chemical devices, where he tries to create potions for the good of the "blue dwarves". He often saves the "blue dwarves" from danger using his vast knowledge. Sometimes (quite often actually) he gets his potions wrong but he always gets there in the end. If the "blue dwarves" have any questions or problems, Kipling always has the answer. He also possess quite comprehensive diplomatic skills in case they meet humans or other creatures, and usually manages to speak without using the "smurf" word.